Okieladybug's Scrap N' More: I Swarmed with some Cricuteers! Yesterday was the Swarm in Norman Oklahoma. 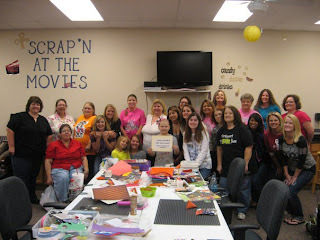 My friend Linda, aka LGuild, and I went up for the day to swarm with some gals from the Cricut message board. I made sure I took my camera and then guess what.......I didn't take one picture! But thanks to Facebook I was able to swipe a few! Linda and I were table mates with Robin and Renee and we had the best time with them! I hope I get them again at the next swarm! Here is a group picture of us, and then one of me where I was the first to get a layout done. Of course with the aid of layout kits it sure makes it a lot easier. 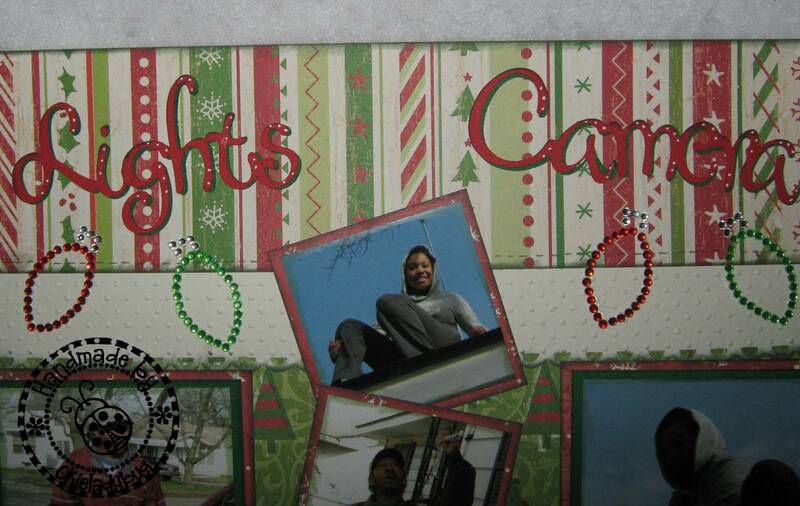 Here are close up pictures of the layout I am holding in the picture. 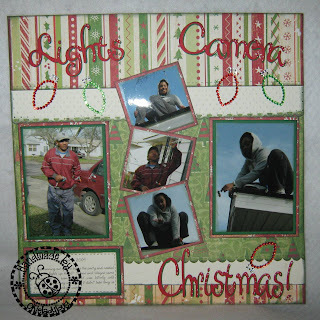 I used 2 patterned papers and some white cardstock for the base of the layout. The patterned paper came from the same DCWV Christmas stack that I have been using for a few years now. I tell ya those 180 sheet stacks last a LONG time! 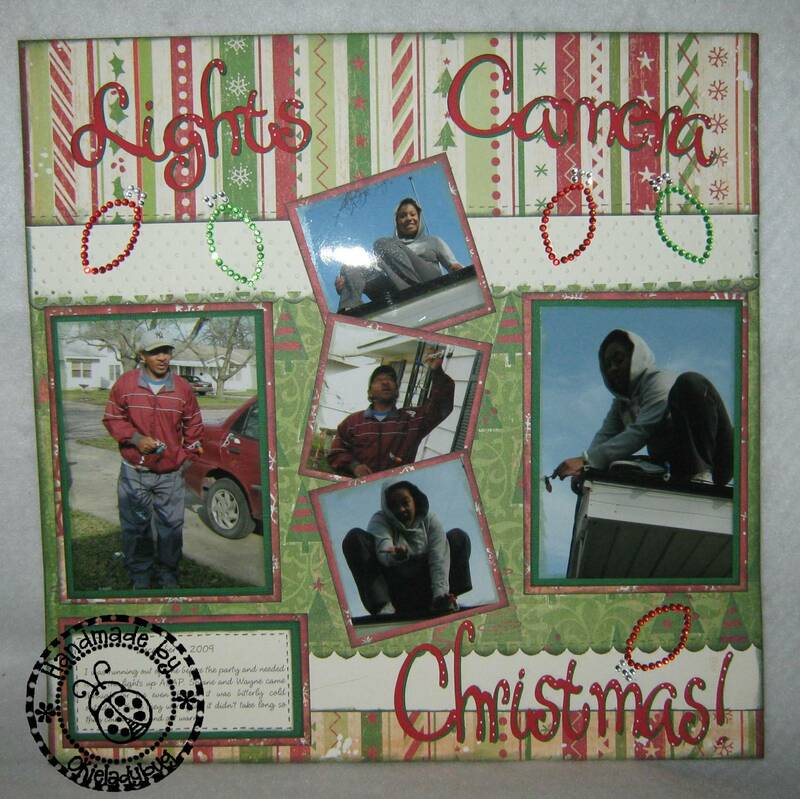 I generally like to get a lot of pictures on a layout and I think the one I used for this one was able to show the story of my daughter and her dad putting up my Christmas lights. My daughter is a bit of a clown and gave me a Spiderman pose that was just too good not to use! Here is a close up of the title at the top. I used a font from Lyrical Letters. I love the fonts on that cartridge but they don't have shadows *okie so loves her shadow layers* so I have to make my own by cutting two and then off setting the letters. You can see a little better in this picture that shows where I ran the white through the Cuttlebug using the Swiss Dots folder and then punched with a scallop punch. Ink? Of course you see inking! Come on you guys know by now that is a compulsive behavior for me! I wanted to take a close up of the bling Christmas lights so you could see them well. You guys know I love bling and I remembered I had these bling stickers when I was putting my layout kit together. 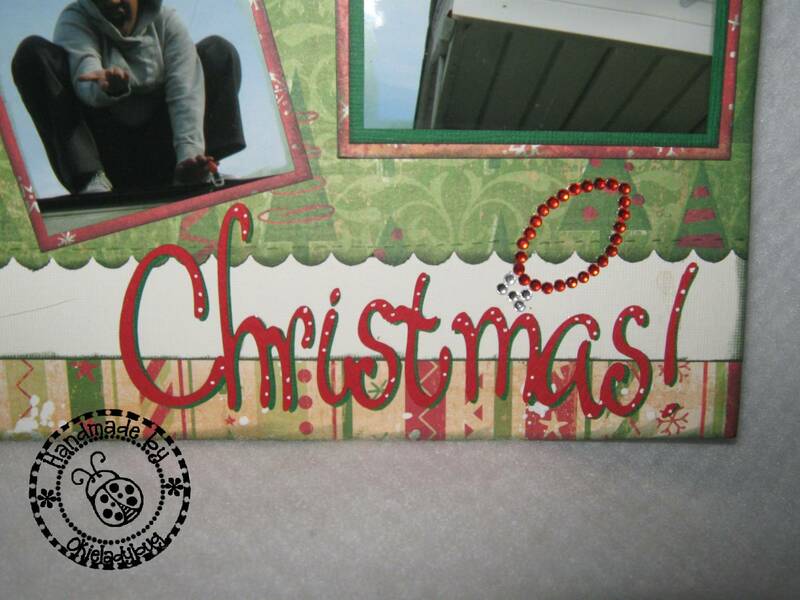 You can also see where I used a scallop punch on the green patterned paper and also added a little faux stitching. Oh yes and a few little doodle dots on the letters, ya know I just can't resist! What do you mean what about the other layouts? Of course I am going to show them. But not yet. Not yet! *okie cracks up laughin at herself for using a line from one of her favorite movies...Gladiator* I will be showing them over the next few days so be sure to come back if you would like to see them! Great job on your LO's. I got a stack of cards made and I usually stick to scrapbooking. Making kits ahead of time help me too. Glad I got to meet you. Great LO and I am a little jelly belly that you went to the swarm as it has been so long since I went to one. I am going to Dallas and hope to meet many of the MB members there. So glad you got to go. thanks for the picture and info about your lo. It's really cute. Looks like you had a great time!! Great LO!! Oh, come on now! You need to tell the "REST" of the story! Where's the mention about your being stoned or smoking your electronic weed while whipping out all your layouts? Or the details about our being late because we had to follow the short bus on a two lane highway in the freakin' rain for over 30 miles? ***Edited to add: Okie was NOT stoned on any illegal substances! ---at least I don't THINK she was! *** LOL! Great layouts! You do great work. Your project looks great...good memories of spider girl. Looking forward to the rest. How fun. Is there another one coming up? Is it only for special cricut members? Woudl love to go. Love the page. I like the title. great job! WOW ... What a great time you must have had ... it looks like such great fun. I love your LO too, you are always soooo organized when you go to crops and swarms, way more so than I am. I spend more time being a social butterfly than actually getting anything accomplished. I need to figure out a way to do both! That's a great layout, Okie; thanks for sharing your inspiration! Looks like everyone had a great time at the swarm, too. Your smile is priceless! Love it! Oh this looks like fun! 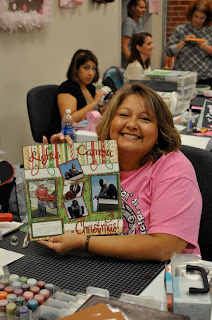 Love your pages and way to go getting so much done. Did you make the kits a head of time? So much fun! Your layouts turned out great!! I just posted on my blog and included a slideshow of the swarm. Love this LO! 5 pics in a one pager is my kind of LO since I'm the family paparrazi :) Thanks for sharing.